The directors of the academies are supported by a team of about 50 Italian and foreign teachers, making up a teaching staff with a high artistic profile. Introductory course of training for dance at different levels. The best way to begin to develop artistic talent through different disciplines! Founded in 1995, MAS is today the largest Entertainment Business College with a 12,000 sq. m. building, large spaces, studios dedicated to dance, acting, singing and music, studios with stages, a drama theatre, music production studios, an in-house radio studio, and new apartments for the students, for an even better and complete study experience. At MAS new talents are discovered, bringing out the students’ artistic talents and developing them to full professional maturity. 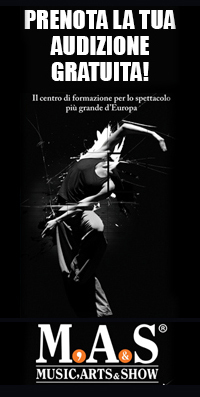 Many of our former students have gone on to an artistic career in the entertainment business See more >> Numerous occasions for collaboration and competition, in order to cultivate talent: Spazio Live biweekly workshop for students’ musical performances; Workshops realized by the students with the guidance of the teachers, to stimulate creativity and synergy among the academies; Regular live performances outside the Academy. Each year MAS promotes an articulated programme of work experience, workshops and contests with first-rate international professionals. At MAS regular open auditions are carried out exclusively for the students: casting for television programmes, concerts, shows, TV series and tours of international artists. Different entities approach MAS for casting and for the organization of events and performances where students have the opportunity to appear live in prestigious locations, in addition to participation in video clips with international artists, flash mobs and festivals.